As a young family, having meals together mean a lot to us. In Southern California where the pace is fast and the cost is higher, we turn to batch cooking to enable us to eat like a prince on a peasant’s budget, and save time on those busy days that spill into evenings. Making extra portions and freezing them for lazier-to-cook days is relatively straightforward. However we quickly found it harder to remember what we had ready to heat/eat, which occasionally left us scrambling when we had one less portion than needed for a whole dinner, or forgot all together and succumbed to take-out or dine-out in our hunger-weakened decision moments. Mitigation attempts had left us desiring more. The paper list taped to the freezer got messy with scribbled out tally counts over time, and only helped us when we looked at it at home. While we may have known there were 10 burritos floating around, we didn’t know when each were created. 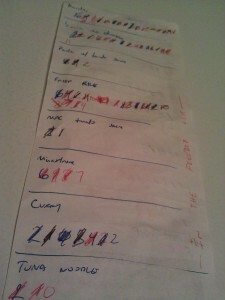 Combine that with the laziness on our part to hand-write dates on sticky notes for each item. Although we hadn’t yet encountered unidentifiable blocks of frozen blob, the potential certainly was there. The paper inventory list gets messy over time, and only accessible at home. And it just counts. 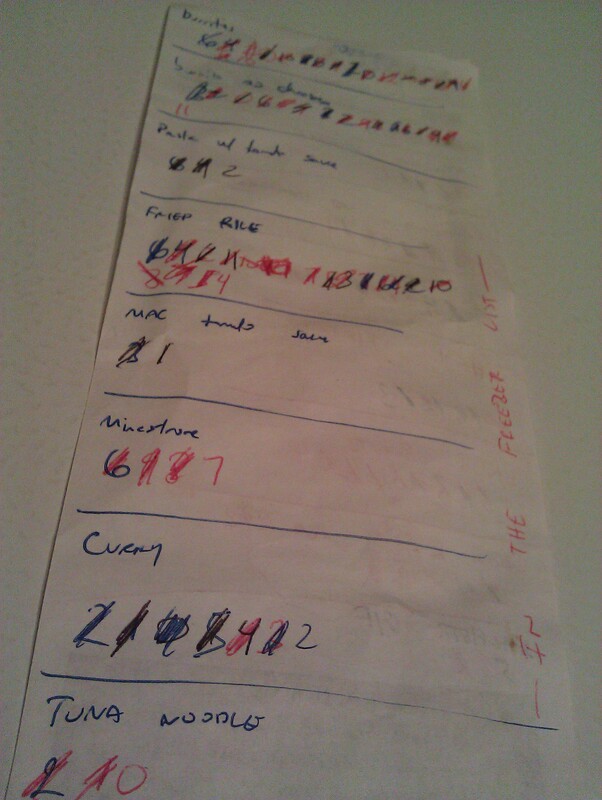 Portable inventory list, in the form of an app, compatible with most devices possible, from the 3 year old 3.5″ econophone to the 3 day old 5.3″+ monsterphone, +/- some reasonable amount of time. Value-Add if solution results in physically better organized food storage. Solution to be designed with equipment and skills on hand. No outside contracting or capital acquisitions outside of normal household operations. Knowledge gaps to be filled using most cost effective methods. Low cost, low risk development. Ixnay on $20k o-scopes and emulators to build a system. 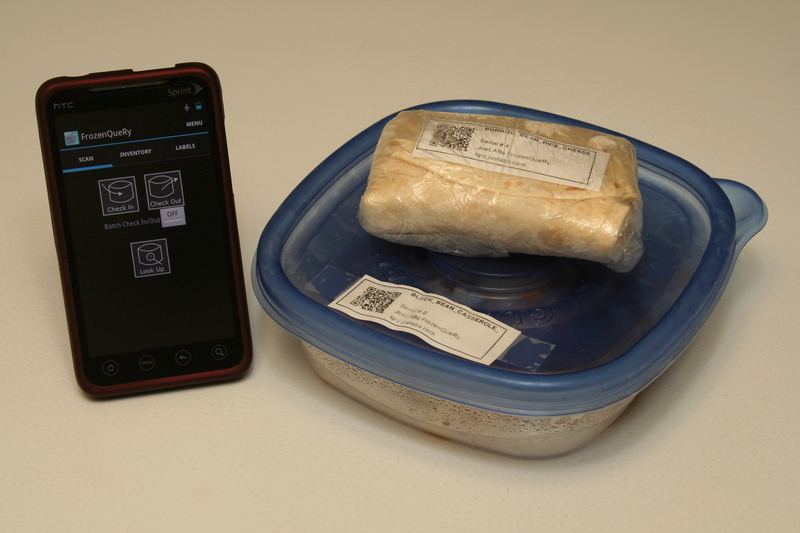 With that, an encoded-label food inventory mobile app was spec’d to target Android 2.2+ phones with a camera of at least 3.2 Megapixels, capable of reading a QR-encoded label generated online through a supporting website. The generated label was specified to carry the entree name, a comment/tag for the labeled item and a serial number for the entree item. The app was to scan the label to record the information and tabulate it into a scroll-able inventory list, and log when that item was checked-in to the inventory. Upon removal of item from storage, an easy check-out scan operation removed the item from inventory listing. From the era that Computer Science was the shiz, I’d learned enough Java before getting totally burned out and switched majors to Electrical Engineering. Good thing too, since Android apps are written in Java, and Android covers practically half of the contemporary smartphone market. Android SDK is freely available for Windows, Linux, and Mac environments, and costs nothing to develop and test with hardware on hand. Since high school, I’d built up HTML+CSS knowledge, and soon afterwards, PHP. So with Java, HTML, PHP, and lots of Google-fu, I worked during time-slivers throughout days for weeks to build the app, and a refreshed JoeLABs website to support it. 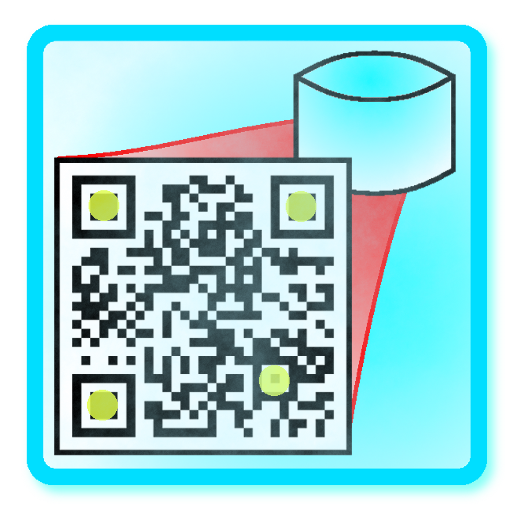 FrozenQueRy – an encoded-label based food inventory app, designed and rolled-out in-house, and made available on Google Play. Not a bad way to optimize a mundane household task. With Software. We’ve been using the FrozenQueRy app here at the home, and happy to report that our food items are clearly labeled and tracked easily using our go-everywhere with us smartphone. No more guessing what we have on hand, and how long we’ve had it.